Plant traits are often associated with the environments in which they occur, but these associations often differ across spatial and phylogenetic scales. Here we study the relationship between microenvironment, microgeographical location, and traits within populations using co‐occurring populations of two closely related evergreen shrubs in the genus Protea. We measured a suite of functional traits on 147 plants along a single steep mountainside where both species occur, and we used data‐loggers and soil analyses to characterize the environment at 10 microsites spanning the elevational gradient. We used Bayesian path analyses to detect trait‐environment relationships in the field for each species. We used complementary data from greenhouse grown seedlings derived from wild collected seed to determine whether associations detected in the field are the result of genetic differentiation. Microenvironmental variables differed substantially across our study site. We found strong evidence for six trait‐environment associations, although these differed between species. We were unable to detect similar associations in greenhouse‐grown seedlings. Several leaf traits were associated with temperature and soil variation in the field, but the inability to detect these in the greenhouse suggests that differences in the field are not the result of genetic differentiation. Some of you know that I serve as Chair of the Board of Directors for BioOne, a non-profit publisher founded in 1999 with the goal of ensuring that non-profit publishers in the life sciences receive the revenue they need to support their journals while keeping the subscription cost to libraries affordable. We now publish more than 200 journals from 150 scientific societies and independent presses on BioOne Complete. Washington, DC — BioOne (about.BioOne.org), the nonprofit publisher of more than 200 journals from 150 scientific societies and independent presses, has launched a new website for its content aggregation, BioOne Complete. Powered by a nonprofit collaboration with SPIE, the international society for optics and photonics, the new site leverages SPIE’s proprietary platform for the benefit of BioOne’s more than 4,000 accessing libraries and millions of researchers around the world. 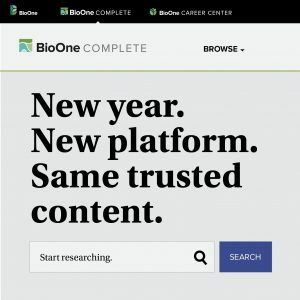 The new site (remaining at bioone.org) was designed with the needs of today’s researchers in mind. The modern and intuitive interface allows for enhanced searching and browsing, and simplified off-campus access. My Library features allow researchers to easily organize and access relevant articles and alerts, drawing from BioOne Complete’s database of more than 1.5 million pages of critical content. For more information about this transition and features available on the new website, please visit the BioOne Help Desk, Resources for Librarians and Administrators, or Resources for Publishers. BioOne is a nonprofit publisher committed to making scientific research more accessible. We curate content and support discourse while exploring new models in scientific publishing. BioOne’s core product is BioOne Complete, an online aggregation of subscribed and open-access titles in the biological, ecological, and environmental sciences. BioOne Complete provides libraries with cost-effective access to high-quality research and independent society publishers with a dynamic, community-based platform and global distribution. about.bioone.org. It is a pleasure and a privilege to greet you tonight, although it is a little odd to welcome you when you’re already eating dessert. It is also dangerous for anyone to give me a captive audience, so I also congratulate Willena on her courage in trusting me, and I promise that I will be brief. I know that the real program comes after me, and I also understand that there may be a party you want to get to. We live in frightening times, but 1968 (when the African American Cultural Center was started) was also a frightening time. Our country was embroiled in the Vietnam War, student protests were exploding, and our cities were burning. There were riots at the Democratic National Convention, Bobby Kennedy was assassinated, and on April 4th the Reverend Dr. Martin Luther King, Jr. was gunned down in Memphis. But 1968 was also a year of hope and promise: The Civil Rights Act was signed into law, the 3rd season of Star Trek featured the first interracial kiss on national TV, and perhaps most important of all, LL Cool J was born on January 14. 1968 was also the year when students, faculty, and staff at UConn came together to establish the African American Cultural Center. For the last 50 years, the Center has been a vital part of campus life at UConn. Its dedication to cultural preservation, leadership, and academic excellence is a vital part of making UConn one of the nation’s leading public universities. As a nation we were founded on the principle that all people are created equal and that we all have a right to life, liberty, and the pursuit of happiness. I don’t need to tell anyone here that we have often fallen short of this lofty principle. Indeed, I need only to mention the names of Michael Brown, Eric Garner, or Laquan McDonald to remind us how far we have to go. But at a time when violent political rhetoric seeks to divide us, the work of the African American Cultural Center is more important than ever. It enriches us all by showcasing the culture, history, and traditions of people of African descent. It binds us together as people and inspires us to imagine a future in which everyone is valued for their unique contribution and in which the culture, history, and traditions of all people are treated with the respect they deserve. 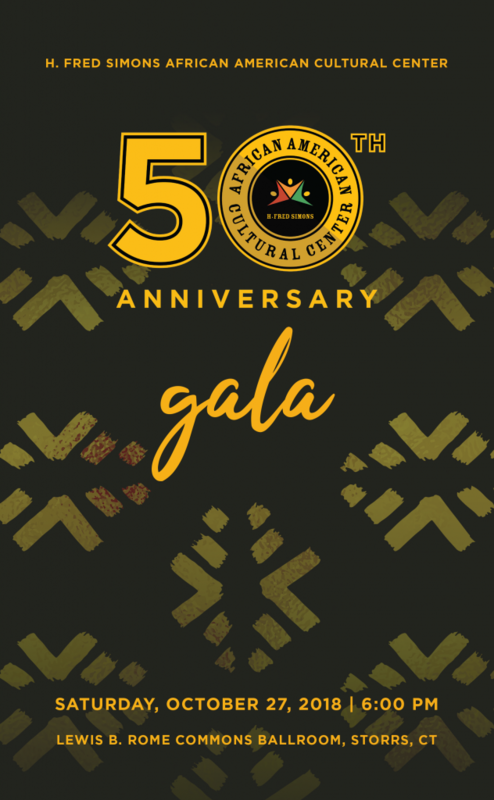 I am honored to play a small part in celebrating the Center’s 50th anniversary this evening, and I am delighted to have the privilege of welcoming you to this celebration. The UConn Humanities Institute asked me to contribute to their “You Should…” series. Here’s a copy of my contribution. But not the Orwell you think. Read Politics and the English language to be reminded that “Political language…is designed to make lies sound truthful and murder respectable, and to give an appearance of solidity to pure wind” and Shooting an elephant for a concrete example of how “when the white man turns tyrant it is his own freedom that he destroys.” Read Leopold’s A Sand County Almanac to learn that when Canada geese return north in the spring “the whole continent receives as net profit a wild poem dropped from the murky skies upon the muds of March” and the many things a poor farm can teach those willing to learn. Read Teale’s A Naturalist Buys an Old Farm to learn Leopold’s lessons in our own backyard on a farm in Hampton. And for the best first sentence in an essay: “In Moulmein, in Lower Burma, I was hated by a large number of people–the only time in my life that I have been important enough for this to happen to me.” WARNING: Descriptions in the essay would have offended many in 1936. More will find them offensive now. Among the iconic figures never alive in their lifetime are Victor Borge, Charles Schulz, and the original Obi-Wan Kenobi Alec Guinness. That last one really hurts. I remember seeing the original in a movie theater. Presidential candidates winning the popular vote and then losing the election are not unusual. There has never been an Enron. It you want to read all 60, here’s the link: http://themindsetlist.com/2018/08/beloit-college-mindset-list-class-2022/. I mentioned last week that I’m reading Williams & Bizup, Style: The Basics of Style and Grace. Yesterday I came across this very succinct advice for the early stages of writing a paper and thinking about how to structure it. When you plan a paper, look for a question that is small enough to answer but is also connected to a question large enough for you and your readers to care about. If you’re a scientist and writing a paper,1 you already have the data and most or all of the statistical analyses done. So the “look for a question” part has to happen twice in writing a scientific paper.2 You need to “look for a question that is small enough to answer but is also connected to a question large enough for you and your readers to care about” before you begin collecting data. Then you need to collect data that will answer that question. Science being what it is,3 after you’ve collected the data you’ll find that there are data you couldn’t collect that you wanted to collect4 and there are data you collected that you didn’t anticipate collecting. In writing the paper you now have to look at the data you have in hand, identify a question that the data in hand can answer that is connected to a larger, interesting question, and (this is the hard part) write the paper using only the data that answer that larger, interesting question. If you’re like me, you5 will have collected other data that don’t fit in this paper. That doesn’t mean they’re useless, and it doesn’t mean you should discard them. It merely means that they’re not useful for this paper. With any luck you’ll find that they are useful for another paper that you’ll write in the future. I do not claim to write well, but I have been writing for nearly 40 years, and I’ve been helping students with writing for more than 30. Along the way I’ve figured out a few things that work for me, so I thought I’d pass a few of them along. Keep in mind that I have no training, and I have no credentials suggesting that anything I write is worth reading. If you find something useful here, use it. If you don’t, ignore it. Better yet, if you find something here you think is fundamentally misguided, leave a comment so that others won’t be misled. Nearly 30 years ago I bought a copy of Wiliams, Style: Lessons in Clarity and Grace. I’ve referred to it frequently ever since. On Wednesday I bought the Kindle edition of Williams & Bizup, Style: The Basics of Style and Grace. I’m just getting started on it, but I can already recommend it. It’s a shorter version of Lessons, but even in the shorter version there’s a lot here that anyone who writes can use. Most experienced writers get something down as fast as they can. Then as they revise that first draft into something clearer, they understand their ideas better. And when they understand their ideas better, they express them more clearly, and the more clearly they express them, the better they understand them—and so it goes, until they run out of energy, interest, or time. They also point out that you can exercise your revising chops on other people’s writing. When you’re reading something that seems complicated and confusing, take a good, hard look at it and see if you can find a way to express the ideas more clearly. If you can, you’ll have the satisfaction not only of having worked out the meaning of that complicated thing, but also of knowing that you had the skill to make something understandable when the author couldn’t or wouldn’t do the Sam thing. The period for public comment ends on 24 September 2018.